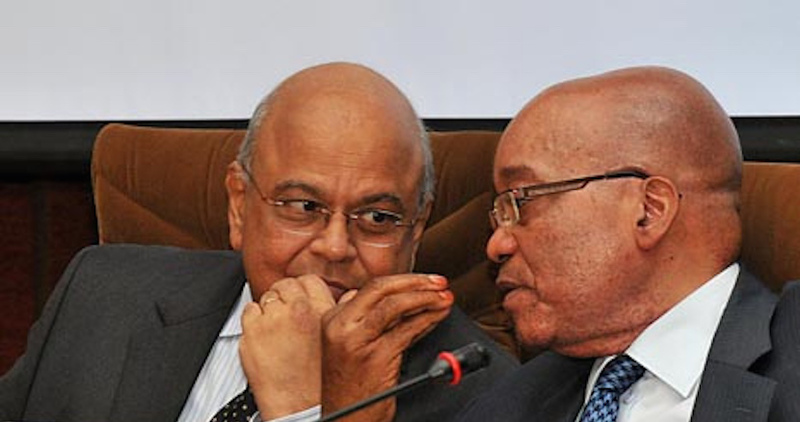 Zuma thunderbolt ahead of reshuffle – Gordhan, Jonas ordered home from UK. At 11:45 today SA’s Presidency announced that the Treasury team led by Finance Minister Pravin Gordhan has been instructed to abort their roadshow to international investors after the first morning. Gordhan, his deputy Mcebisi Jonas and the Treasury’s top brass who are trying to sell SA bonds to global money managers have been told to cancel the New York leg of the roadshow and return from London tonight. The thunderbolt from SA’s embattled President Jacob Zuma could hardly have been telegraphed more emphatically. 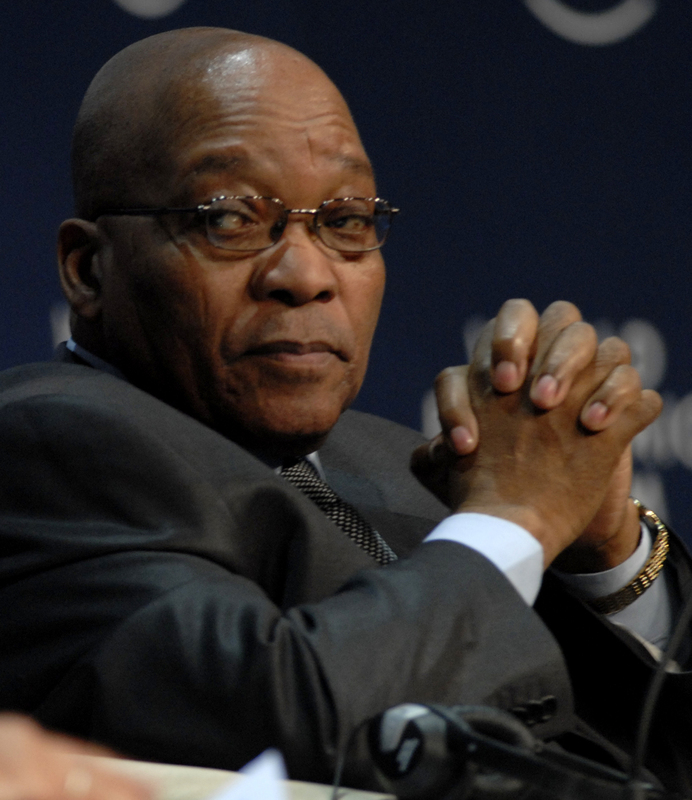 Insiders say Zuma has been patiently building up to this moment for months, and after caucusing over the weekend, believes he now has the political heft within the ruling party to wield his big stick and rid himself of enemies in the cabinet. The Rand dropped sharply on the news of Gordhan’s humiliating recall. It is poised to hit Nenegate-like skids if, as now appears likely, Gordhan is replaced by the compromised former Eskom boss Brian Molefe, a Zuma favourite and close associate of the crony capitalist Gupta family who was recently appointed to Parliament as an MP. From his side, Gordhan will have been expecting this for some time and will have been doing some lobbying of his own. The reaction of his supporters in civil society, business and within the ANC ranks is sure to determine the country’s future. The insider added that developments over the past two weeks reflect the level of desperation by those pulling the levers of power. Among bizarre recent events have been a burglary in the office of the Chief Justice; Zuma’s defence of an incompetent Social Welfare minister; the escalation of hostility between Treasury and SA Revenue Services; and the high court finding against another Zuma favourite, Police General Berning Ntlemeza. (Bloomberg) – South Africa’s President Jacob Zuma has instructed Finance Minister Pravin Gordhan to abort a week-long roadshow to meet with investors and rating companies in London and the U.S., according to people with knowledge of the matter. 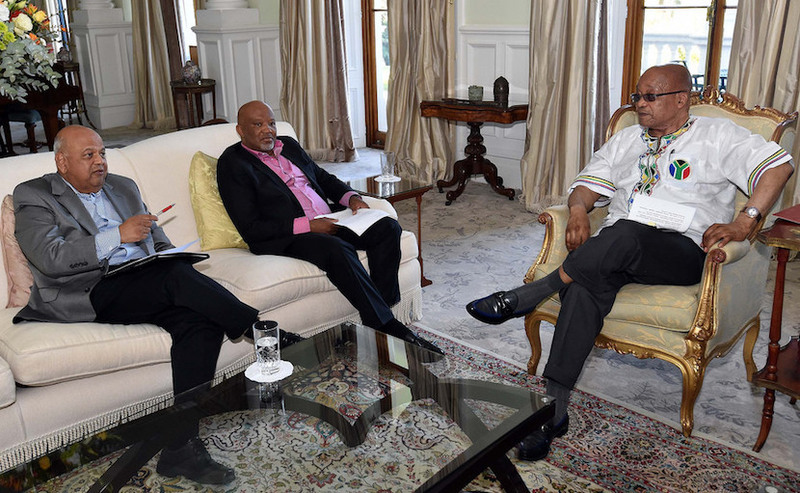 President Jacob Zuma meets with Finance Minister Pravin Gordhan and Deputy Minister Mcebisi Jonas to discuss the final touches to Budget 2016. Gordhan, who left South Africa on Sunday to lead a delegation that includes business executives and labor union representatives, referred queries to the Presidency and said by phone Monday that he is carrying on with his plans to meet investors in London. Gordhan, Deputy Finance Minister Mcebisi Jonas and Treasury Director-General Lungisa Fuzile received text messages from the Presidency telling them to cancel their trip, according to the people who spoke on condition of anonymity because they weren’t authorised to comment on the matter. Jonas was still in South Africa when he got the message. "If true this will trigger speculation of a cabinet reshuffle which will be detrimental to the economy." The rand weakened as much as 1.6 percent against the dollar to 12.6381 at 11:29 a.m. in Johannesburg, reversing earlier gain of as much as 1 percent. Presidency spokesman Bongani Ngqulunga didn’t immediately respond to phone calls seeking comment. Treasury spokeswoman Yolisa Tyantsi referred queries to the Presidency when contacted by text message and email. (Bloomberg) – South Africa’s rand erased its advance to become the worst performer in emerging markets on concern the nation’s political risk may rise after President Jacob Zuma ordered his officials to return from a roadshow. The currency sank 1.6 percent as of 11:26 a.m. in Johannesburg to 12.6341 per dollar, reversing gains of as much as 1 percent. President Zuma instructed Finance Minister Pravin Gordhan to end a week-long roadshow to meet with investors and rating companies in London and the U.S., according to people with knowledge of the matter. The currency’s decline is the steepest among its emerging peers. The Save South Africa campaign believes President Jacob Zuma is acting with unbridled recklessness in instructing the Minister of Finance and his Deputy to cut short their visits to the UK and USA. These visits have been carefully planned with business and labour as part of South Africa’s efforts to stave off a downgrade of our sovereign investment status. It is an initiative that the President himself has endorsed. 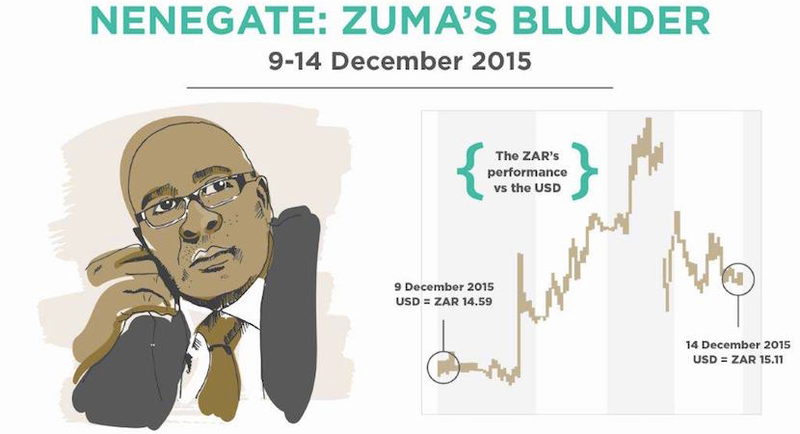 The effect on the Rand in the aftermath of the President’s announcement constitutes a form of economic sabotage. It is a sign of extremely weak leadership and completely unsettles perceptions of South Africa’s stability — as can be seen in the way the rand has tumbled on foreign exchange markets. A rapidly depreciating rand has a massive impact on the South African economy, and its ability to effect economic transformation, whether radical or not. The ultimate victims will be the poor, and Zuma must be held accountable for his style of politics. It is clear that he has no concern for South Africa, its image abroad, or the people who will suffer the consequences. Parliament should summon the President to explain and account for his actions. But if Zuma goes on to recall Gordhan and/or Jonas from office in a Cabinet reshuffle, it will be clear that what we are really seeing is the final, desperate push in the state capture project. President Jacob Zuma may be in the mood for power politics — but he can rest assured that South Africans will not take this lying down. 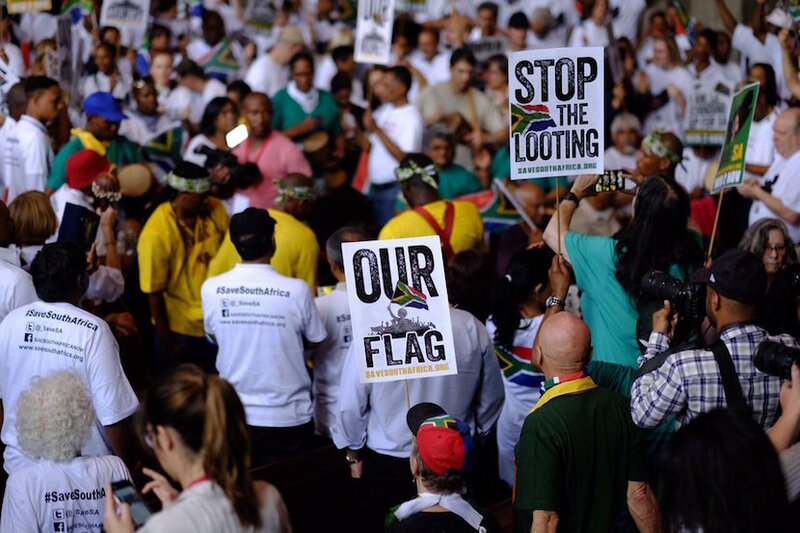 This increasingly-desperate President must be stopped in his tracks, and we call on all sectors of society to unite in opposition to his dangerous strategy that is aimed at furthering the state capture project. Clearly, Zuma and his cohorts can no longer wait to get their hands on the public purse. Access to the state kitty, through the front door of National Treasury, is more important to them than the national interest. They want to loot, and loot with increased haste, while they still can. Only South Africans can stop them, and save South Africa.